The Armstrong-Whitworth AW.650 Argosy XP411 (c/n 6766) was world's first turbo-prop powered freighter. The project was initiated in 1956 and the prototype first flew on 08Jan58. Riddle Airlines ordered 7 AW.650 series 100 and British European ordered 3, too. The BEA example (designated series 102) were later traded in for 6 Series 200, which were heavier and had more powerfull (Rolls Royce Dart) engines. The largest order was placed by the Royal Air Force, which ordered 56 AW.660 C.Mk.1s. The Short Belfast C.Mk.1 (XR371) was introduced in service with the RAF in 1966 (only 10 of an intended 30 were produced, all for the RAF) and provided transportation on long range distances. The Belfast had a larger capacity than the Lockheed Hercules and could accommodate cargo with dimensions upto a height of 3.66 meters and 3.66 meters wide. Not many can do that. Its loads contained helicopters, boats, spaceships, containers, military vehicles, etc. For the RAF the Belfast could carry 150 fully-equipped troops or a Chieftain tank or two Wessex helicopters. Belfast C1 XR371 was flown to Cosford in the Autumn of 1978. SH.1816 XR362 G-BEPE HeavyLift. Scrapped Southend, UK, Feb94. SH.1817 XR363 G-OHCA HeavyLift. Withdrawn from use for spares at Southend, Essex, UK. SH.1818 XR3642 HeavyLift. Scrapped Southend, Essex Aug01. SH.1819 XR3652 G-HLFT, 9L-LDQ Jan03 at Prestwick, for South Pacific Air (Australia). SH.1820 XR366 Scrapped Southend, UK, Feb94. SH.1821 XR367 G-BFYU Scrapped Hucknall, UK, Jun79. SH.1822 XR368 G-BEPS Scrapped Hucknall, UK Aug79. SH.1823 XR369 Scrapped Hucknall, UK Jul79. SH.1824 XR370 Scrapped Hucknall, UK Jul79. The list was updated with Oldprops Census at www.oldprops.f9.co.uk, but the website is no longer current (2005). The Cosford Aerospace Museum has Vickers Viscount 701 G-AMOG (c/n 7) preserved, in the colourscheme of British European Airways. TCA (later Air Canada) placed an order in November 1952 and Vickers realized it could improve its design by taking in account the feedback of TCA and make it marketable for the rest of the world. The basic AV.630 design was stretched into the V.700. 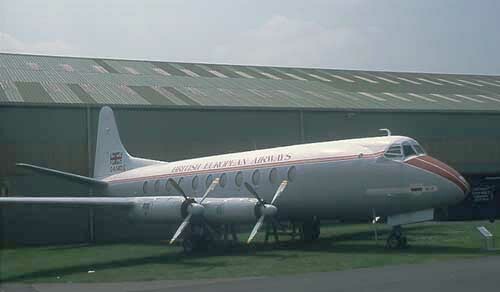 G-AMAV, the first of the 700 Series, first flew in the colours of British European in 1953 (but was never used by BEA). The BEA fleetlist in 1968 listed 39 Viscounts (Series 802 and 806), some of them leased to other operators. 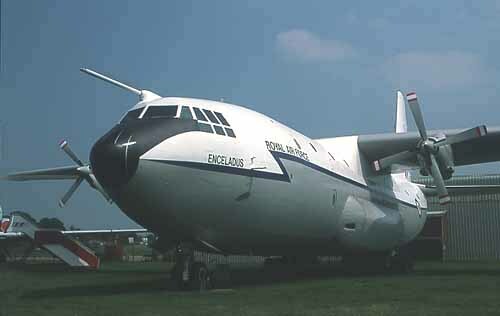 When BA pulled the plug on this museum, G-AMOG was donated to the National Museums of Scotland for display Edinburgh's East Fortune airfield; see my report 12JUN11 visit. The British Airways Museum Collection of airliners is on the move to new homes. The five historic aircraft, owned by British Airways and displayed for many years at the Royal Air Force Museum, Cosford will all be relocated and re-housed in the coming months. The decision to re-house the aircraft was made following a review of the aircraft by British Airways and the Trustees of the Royal Air Force Museum. The first aircraft to be moved will be the Boeing 707-436 (G-APFJ). This airframe will be transported to its new home at The Museum of Flight, East Fortune, part of the National Museums of Scotland. The aircraft will be dismantled and transported to the Museum of Flight by Air Salvage International. The National Museums of Scotland will be communicating in due course as to when the Boeing 707 be on display to the public. Vickers VC-10 (G-ARVM): Cockpit and front fuselage section relocated to The Brooklands Museum.